With the Hemidall Jump Station destroyed the survivors on Hypatia have no way to get back to our Solar System, they're stuck in the far reaches of the galaxy with no hope of help arriving and not enough supplies to last them. Their only chance is to head back to Kerenza to see if there is anything left of the mining colony BeiTech set out to destroy. Meanwhile, on Kerenza, Kady's cousin Asha is one of the survivors of the initial assault and has been secretly working with the resistance ever since. BeiTech has control of the colony but everyone knows that as soon as they've managed to repair their damaged jump ship the Kerenza survivors will be murdered and BeiTech will be free to leave the system with very little chance of ever getting caught for their crimes. Time is running out, the only question is can the miners delay repairs on the jump ship long enough for the Hypatia and Hemidall survivors to reach them? 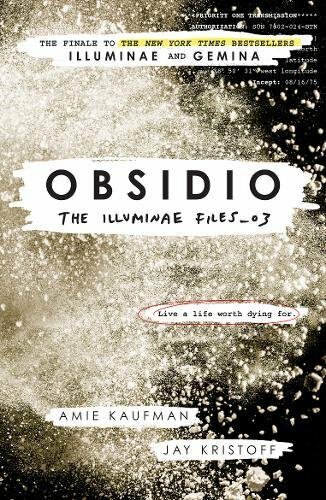 I fell in love with this series the minute I picked up a copy of Illuminae so it's no surprise that Obsidio was one of my most anticipated reads of the year. This series has been absolutely incredibly from start to finish and I'm very happy to say that it went out on the highest of high notes. If you've read the previous books then you'll have a good idea what to expect from this book, it's in the same clever format full of interviews, emails, instant message conversations, diary entries, video logs and so much more. I still can't get over how creative these books are and how incredibly well the format works for the story. Somehow Amie Kaufman and Jay Kristoff manage to create such brilliant characters and then put readers through an emotional wringer that is actually pretty exhausting but ridiculously satisfying at the same time. It won't surprise fans to know that this book is just as fast paced, action packed and full of jaw dropping twists as the previous two. We get to meet some fantastic new characters and I loved seeing what has been happening on Kerenza while we've all been away. It's pretty heartbreaking to see how much of the colony has been destroyed but I loved seeing how clever Asha and the rebels were and the way they are fighting back. At this point they've got nothing to lose and they're determined to take down as many of BieTech's soldiers as they can before they die. We also get to spend plenty of time with our favourite characters from previous books, everything has been so cleverly written that little hints from previous books suddenly make so much more sense here. I decided to reread Illuminae and Gemina before starting Obsidio and I'm so glad I did, not only because they were excellent enough to stand up to a reread, but also because there are so many little things I'd have missed without that refresher. It's very rare to find a series that I can rate 5 stars from beginning to end but that's what you've got with the Illuminae Files. I'm so sad it's over but I have loved every minute of the journey and it couldn't have had a more perfect and fitting end. I know this is a series I'll be rereading in the future but in the meantime I can't wait to see what else Amie Kaufman and Jay Kristoff come up with. I already love everything else I've read by them - both written together and separately - so they're definitely auto-buy authors that I can't recommend highly enough.